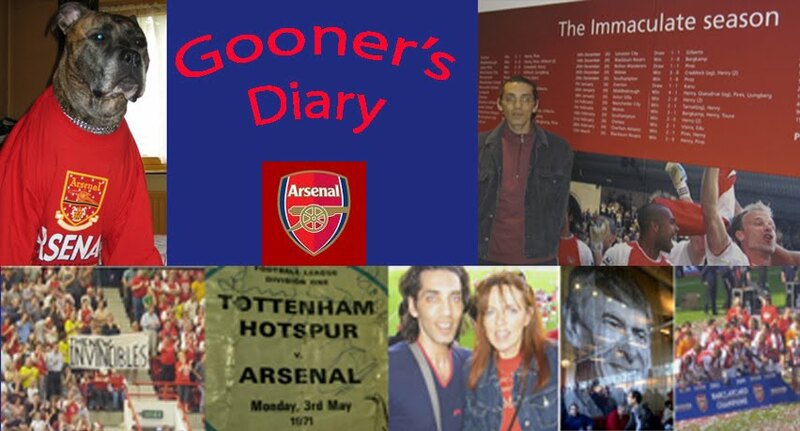 Gooner's Diary: "Steve Gerrard, Gerrard......"
".....he kisses the badge on his chest, then hands in a transfer request. Steve Gerrard, Gerrard"
I’ve been castigated in certain Gooner quarters for suggesting that up until recently we hadn’t actually been playing as well as the media hyperbole would have you believe and that our elevated status was more a reflection of the mediocre start to the season made by our competitors. I stand by this, as I firmly believe that the fact that the much unfancied Flamini and our two full-backs have been our players of the season so far, is all the evidence needed to confirm that many of the more illustrious Gunners had yet to hit a genuine groove. Don’t get me wrong, I’m not saying that we haven’t entertained, as we’ve produced purple patches of absolutely sparkling football, ever since day one. But with Arsène having set the Arsenal bar so incredibly high, up until the trouncing of the hapless Slavia Prague last Tuesday, to my mind the individual instances of brilliance were too disjointed, stalling on a wayward pass, or without any sting to the final ball. With so many of our players still struggling for the delicate touch and control that is their trademark when in top form - even those who’ve been banging in goals for fun like Adebayor, Van Persie and of course Fabregas, might’ve been working their socks off, but few present would suggest they were in top form – we had yet to witness 90 minutes, nay even 45 minutes of the sort of total footie that would stand as testament to our true title credentials. That was until Sunday! Obviously our confidence must’ve been soaring, after seeing off the Czech lambs to the slaughter in the Champions League midweek, where we laid down the sort of marker, which was bound to make the rest of Europe sit up and take notice. But after Gerrard attempted to strike the cover off the ball with his extremely effective opening gambit (albeit aided by the sort of gaping hole in our wall which the Liverpool captain could’ve driven a truck through! ), the 40-minutes which followed was as dominant a display as I’ve seen from an Arsenal side playing at Anfield. Not that there wasn’t continued frustration at our failure to capitalise on our first-half superiority, as all our flowing football came to naught in the final third. Far too frequently we resorted to a diagonal ball into the box that was meat and drink to Hypia and Carragher, with a solitary and somewhat isolated Adebayor all too often out-jumped. Considering we can move the ball with such incredible pace, I simply cannot fathom our reluctance to continue down the flanks to the byeline, from where a ball whipped in is much harder for the opposition keeper to deal with and which would force the lumbering defence to attempt to clear, whilst running back towards their own goal. However it’s churlish of me to moan about such trifling matters as actually putting the ball in the net, or the odd misplaced pass, when from a purist point of view the Arsenal were poetry in motion for much of Sunday’s match. That doesn’t mean that that there was a sudden improvement in the level of individual performances, but you sensed that everything was ramped up a notch for what was an all-together more high quality contest than many we’ve played to date. Our passing was crisper with the ball forced to travel much more quickly around its triangular course, by the way in which Mascherano and co. were doggedly hunting us down in packs. While on the rare occasions that we were not in possession, 0-1 down and facing their stiffest examination of the season, our defence was a study in concentration, knowing they couldn’t afford a second slip up. The media have praised us to the hilt for sticking to our principles. Yet in truth Arsène Wenger’s side only knows one way to play, as suggested by the refrain which echoed out from our end of the ground for long periods of the game “Liverpool hoof the ball….Arsenal pass the ball”. In hindsight the script was written in the way the two managers set their stalls out, with our five-man midfield forcing the Scousers to chase shadows for much of the match, but with Adebayor struggling to make much of an impact. However with the home side’s three pronged forward line, their occasional foray’s forward were somewhat more direct, forcing Manuel Almunia to demonstrate that Lehmann hasn’t been left on the bench merely out of spite. Naturally going a goal down wasn’t what we’d have wished for, but without Gerrard’s early strike I rather suspect we’d have witnessed a far less enthralling contest, with both sides probing for a weakness without really committing men forward. Whereas Liverpool were on the back foot right from the restart since we had no choice but to force the issue, taking the game to them as if we were the home side and they the visitors. You could sense the effects on the Liverpool psyche of Benitez’s constant tinkering, because once the initial euphoria of taking the lead had subsided a nervous hush fell across the home crowd. Then again it’s not the first time we’ve found ourselves teasing “where’s your famous atmosphere” at Anfield. Although my own nerves were also up to ninety. The previous day’s results at Old Trafford and Stamford Bridge had made it even more important that we reaffirm our right to sit atop the pile, as despite our dominance in this game, without Fabregas’ 80th minute equlaiser, instead of singing our praises, the media would’ve undoubtedly begun to write us off as lacking sufficient substance to maintain a credible challenge. It’s either black or white as far as the press are concerned, either we are the best thing since sliced bread, or a bunch of immature kids who can’t possibly hold their own in the manly marathon ahead. Obviously this was just the first in a succession of formidable hurdles, but it was vitally important that we didn’t fall at the first as personally I believe Sunday’s fightback could prove psychologically significant in the mental development of this young squad, as is next weekend’s encounter with Man Utd. And if we can emerge from both these fixtures with our unbeaten record intact, the Gunners will have thrown down the gauntlet by establishing the pace the competition will have to keep up with, if they’re to continue breathing down our necks. Stranger things have happened but considering our dominance, I would’ve felt incredibly hard done by to have departed Anfield with our tails between our legs and when it eventually came, Fabregas’ equaliser was nothing less than we deserved, making our nine hour round trip trek seem worth every arduous, traffic-ridden minute. Mind you it all could’ve worked out very different. Standing queuing for my half-time cuppa, there was little evidence of any panic in the air at our end of the ground. With continued patience and plenty of application, it always felt as if we had the weapons to prevail. However just as I was about to be served, my mobile phone rang and it was Róna on the line, in a frantic state, having just exited Brent Cross Shopping Centre, babbling about the car having been stolen. For a minute there, I thought the fates were against me and it was all going to pot, that I’d be ending the weekend with the Arsenal conceding top spot to Man Utd and with my motor knocked off! Meanwhile it was only moments later that the penny dropped and having enquired of my missus if she’d applied the steering lock, I was virtually certain that she’d merely returned to the wrong floor of the massive car park.